Benchiew is correct. You ask about easy upgrade and that requires qualification.The XM-L and HiCRI 119 require different reflectors in the Haiku and you don't interchange light engines mixing LED's. If I am building a light engine for someone, I need to know what it is going into so I can properly place the LED leads on the MCPCB and cover them if necessary with Kapton tape. The user needs to be careful in any light engine removal on a Haiku to insure that they don't lose the small O-ring in the back of the reflector or have it move out of place during a LE exchange. I can and have made LE's available to folks and will continue to do so but i don't want to give the impression that it is necessary an easy exchange requiring no thought or consideration. Cost of an AA HiC LE is $125 and an AA XM-L LE is $130. Agreed. In fact in the past years I have played a lot with my Gizmos (complete disassembly, bead blasting, anodizing, Led swap...) and I have own quite a few of your products. I realize I have come to know your design quite well and tend to forget some "details" are not obvious to others. There is room for messing up a light indeed so a word of caution is helpful here. As always one must know what he's doing while modding/upgrading/altering a light. A runtime test using a fully charged Eneloop X Black on high gave me 2.5 hours before stepping down. Received mine (HiCRI 119) today and found that it fits the Maxpedition 4" Flashlight Sheath nicely. (Flashlight lens facing up as the sheath has a drainage grommet at the bottom. I guess someone could cover that grommet if desired.) fyi: the flashlight, as I measure it with the Haiku head, is 4 3/8 inches long. Last edited by ajl; 05-07-2013 at 04:15 AM. That basically means 1 hour per 1000mAh under an NiMH battery, nice! Thanks for the report. Yup. The quantum is correct. Picture posted above this morning. 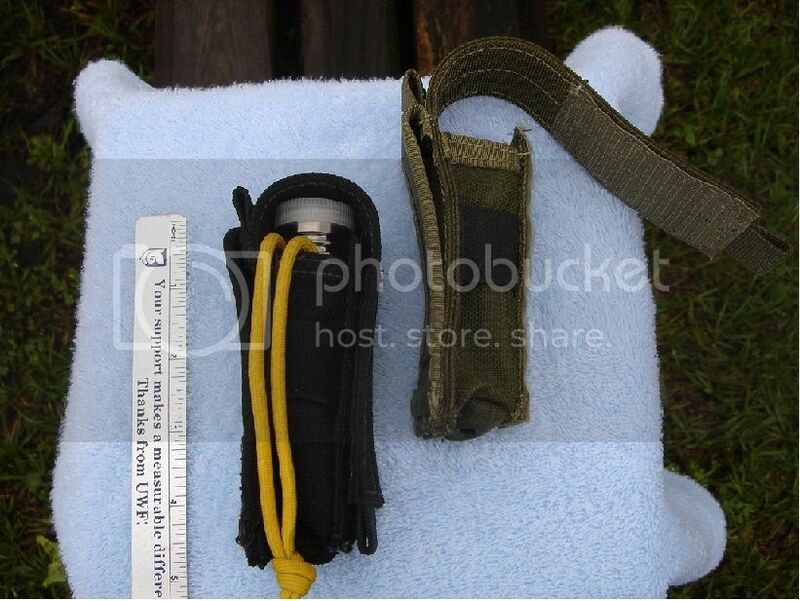 These are the 4 inch Maxpedition Flashlight sheaths with the AA Haiku. If you look closely at the olive drab sheath you can see the drainage grommet at the bottom. I keep a water bottle top over my flashlight to keep the lens clean and scratch free. Inexpensive and it works for me. Sent my order in for a Mule Hi CRI today. I'm sure a haiku Hi CRI will soon follow. This will be my first Ti light and my first Mcgizmo. Don, you should have stayed for dinner. My new AA LE arrived today. You must have delivered it yourself, because the shipment time from Maui to my house in Canada was <6 days. I was not sure I would like it... but it is very excellent. The high output is respectable and the lower low is great. Will the AA body work on my LS20? No. The LS20 requires a piston drive type body. The AA is e series compatible. Thanks for the info. I might just get myself one of those sheath. I just bought a black one from a local supplier for $20 shipped. Hope to get it next week. Quite a few years ago I had considered the feasibility of a flashlight design that could accept both AA and CR123 without swapping or other user-interaction on the battery housing itself. Now that your converter exists such that both AA and CR123 are happily accepted forms of power, is this a design consideration that you are willing to entertain? I explored the idea with 4sevens and Kuku427 several years back and nothing came to fruition, but perhaps you would be able to take the next step of making it reality. If you're interested, I'll email you on how I think it could be done. With the wider range of input voltages most converters are accepting nowadays, I wish it would have taken off more, but like you said - they're few and far between. I can envision a pak that will accommodate both single AA and CR123 cells but it seems to me that one would also want the ability to use RCR123 and I really question just how much real need for such a pak there is. At present I am attempting to carry and support this series now with four different heads and four different battery paks and three different converters and two different LED's. I recall years ago the expressed real interest in a 17500 pak for the Aleph series and of course that pak would work for both CR123 (with spacer) or single AA battery. Those paks were made and sold like tickets to a broken carnival ride. I can only do so much as a one man show and presently I have invested a significant amount of time and funds to a new, 18650 twisty dive light. I can't say you have piqued my interest here. Sorry. Email sent for a single AA Mule with HI CRI. I can only do so much as a one man show and presently I have invested a significant amount of time and funds to a new, 18650 twisty dive light. Interested to learn more about this dive light, 18650 would be nice. I would imagine this light would need to be pretty bright. Will it operate safely out of the water since the intended environment would super cool the light? One can hope, Benchiew... My interest is piqued as well! When hope becomes reality, this is where my pocket will hurt. But I am happy to let that happen. - What color bin of XM-L i used? - Which head/LED combo will have the best throw - Haiku XM-L or Haiku Hi-CRI? Last edited by Drywolf; 05-31-2013 at 09:16 PM. If you are asking about the HiC VS XM-L on a single AA then the HiC will have better throw because it is a smaller die and is better collimated behind its reflector than the XM-L is. If you are asking about the two Haikus on a single 1x123 or 2xAA or 2X123 then I would guess the XM-L would have greater throw even though it has a much larger spot and is not sharply collimated. I am guessing that the much higher flux would lead to a greater throw. I am guessing here because I have not tested these various combinations. Drywolf you can add me to that list. Don, i absolutely loved the beadblasted haiku. The most beautiful light ive ever seen.